Clearly, the Monsters of Monsters Inc. are ideal for a series – loveable, colourful (akin to Cars, ripe for toy-manufacturing…) and set within a world that has comedy fed into its foundations as ‘scares’ are merely the day-to-day job and us humans are oblivious to this alternate world. How frustrating it was to end this set-up in Monsters Inc. as Mike (Billy Crystal) and Sully (John Goodman) realise that laughter is more powerful than scares – and the fate of Monsters Inc. is changed irreversibly. Directed by Dan Scanlon, this is his first feature at Pixar after working in the Art Department for Cars and, rightfully, he takes us back in time. 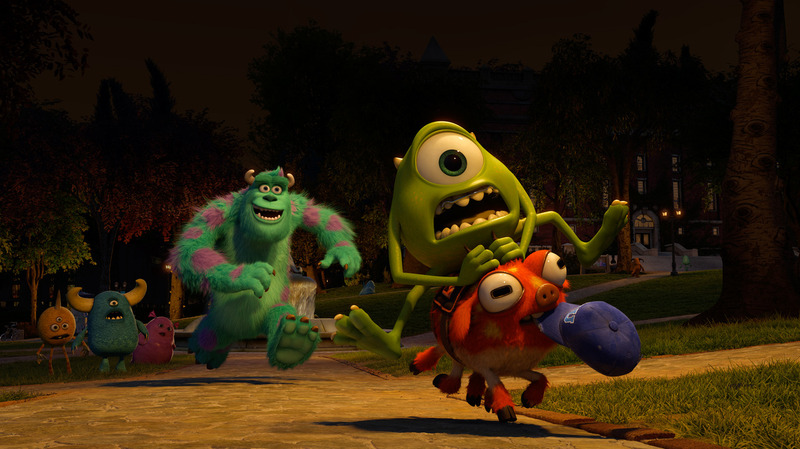 Monstropolis still creates energy through scaring and we are shown the academic route necessary to become an elite “scarer” as Mike joins Monsters University and meets Sully for the first time – a world whereby Sully, the son of a historic monster, is laid-back, lazy and selfish. 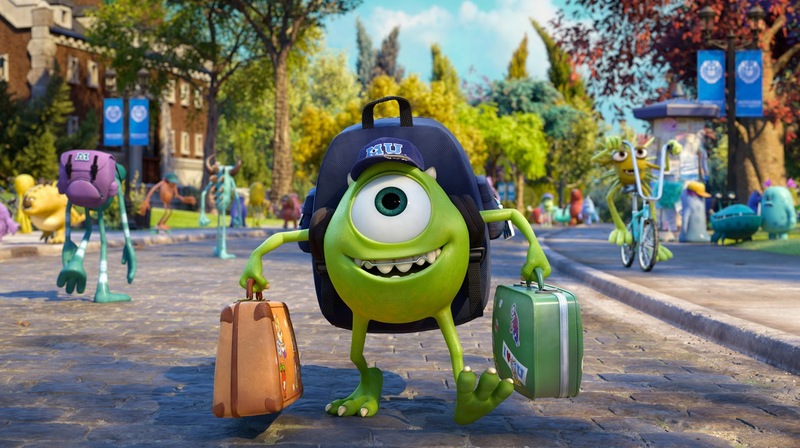 Many things has to change to join the dots between Monsters University and Monsters Inc. including Mike and Sully joining the company, Sully changing his carefree attitude and Mike – who has obsessed and dreamed about working on The Scare Floor since childhood – altering his passion and choosing to be a sidekick to the mighty James P. Sullivan. In a range of quirky and vibrant set-pieces, akin to reality TV shows such as The Voice, Mike, Sully and the Oozma Kappa’s prove how scary they are. Running through a gauntlet as pink-spikey things swell up the body-parts they touch, silent-library sneaking and a “scare-off” competition as each team member scares robot-kids add pace and fun ‘quests’ for our characters to complete. They highlight how versatile the universe of these monsters truly is – and so, when we fall into “reality” in the final act the tone shifts and we realise how dark and scary our world is in comparison. 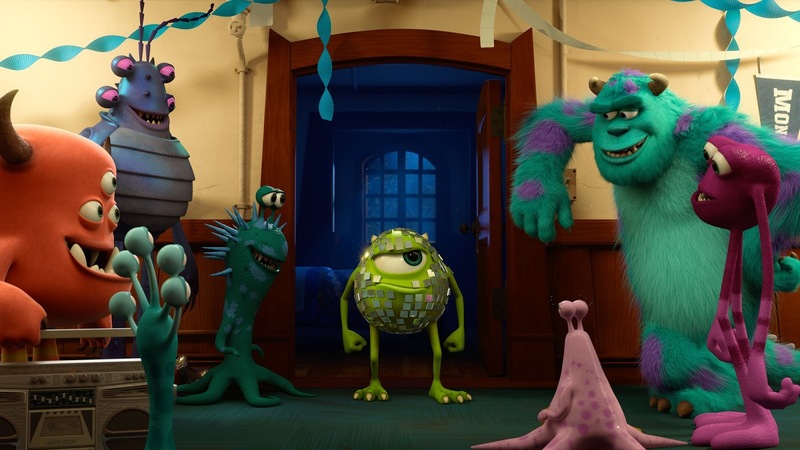 This really is the films strength as Monsters Inc. hints at the idea that many of things we fear are not scary at all while Monsters University clarifies how the true fear may be the world we live in – as Mike and Sully live within a playful world of fantastical games and comedic creatures. This final act, in terms of pace, seems slower and therefore acts more of an extension to the core narrative – but the shift in tone and connection to reality is worthwhile and offers an interesting theme to sneak through. 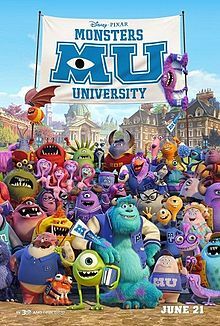 Monsters University is thoroughly enjoyable and it establishes a set of characters that we want to see more of – but it unfortunately ends with very little scope for a further story (Maybe “Monsters Pre-School”?). Though we have devilishly funny moments (Steve Buscemi’s ‘Randall’ is absolutely hilarious) there seems to be an unclear message to the story we’re told. Children will believe Dean Hardscrabble (Helen Mirren’s) is the villain of the film – but she’s not evil and is merely a strict disciplinarian. Indeed, the true villain is Mike himself as he ignores how unscary he actually is and, through all the games and action, this is where the tension lies. In this theme, and in how it is resolved, it is heart-breaking and troubling to imagine children taking it too seriously. Pixar’s greatest strength was the morals and sentiments that were embedded in the stories – ideas that appealed to adults moreso than children; Wall-E and social-change; Cars and industrialisation; The Incredibles and diversity. Monsters University has no such sentiment, and it is this that is the films greatest loss.